CATHEDRAL Ceilings welcome you into this beautiful like new 4 BR/2.5 Bath home that is screaming with curb appeal. 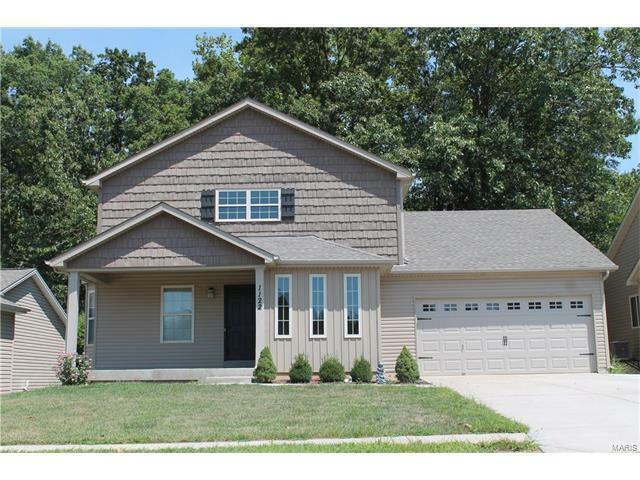 This house was strategically designed with a main floor master bedroom suite, 2 bedrooms upstairs and a 4th downstairs. The master bedroom offers a big walk-in closet, private full bathroom with a walk-in shower, bay window and main floor laundry just down the hall. The kitchen boasts 42” cabinets, stainless steel appliances, backsplash and center island with breakfast bar. The Finished Walk-out basement is equipped with a bedroom, family room and your very own Media room! The 2-car oversized garage has a convenient back door that leads you to the 18x10 Covered Deck. Home favorites: Cathedral ceilings, covered front porch and covered back deck, backyard privacy, upgraded kitchen, media room and over 2,600 sq ft of living space! Also conveniently located next to the 603 acres of Indian Camp Creek Park for hiking, biking, fishing and pavilions for picnics. Highway 70 West to Hwy 61 North. Left on Dietrich Rd, Left on Jaxson Drive, home on left.